Walking homeward from Clapham Junction at about 5.45 in the evening on Thursday, past the Clapham Common Westside, Bowling Green and Tennis Courts - SW4 9AN, Krishna notices bystanders peering at at the tennis premises from outside by the railings. The sensation causing spectacle was a FIRE in the corner of the Bowling Green clubhouse veranda! Sensing the emergency and wishing to help on seeing the distress to a place where he has played tennis since the age of 8 years he acted. So Krishna rushes in and sees people and kids standing around outside in the dark reacting with mobile phones to the spectacle. Deciding that the fire was small enough to put out, Krishna empties a metal bin (spotted in pictures below) and rushes to men's toilet basin taps. Having filled the metal bin with little water he carries it to the front pavilion and splashes it on flames' source underneath veranda benches. Alex, the park attendant on duty in the hut but now out, shouted "Well done Siva!" after seeing the fire-fighting efforts. A young coach David who had been sitting in his car during a break had followed Krishna's dash into the tennis courts, later shouted a warning to the effect of "Siva the roof might collapse! ", as Krishna was IN the veranda splashing water with the bin. After pouring the third pail of water, gathered in the sickly smoke-filled men's toilet, and with Dan's efforts (another LTN coach) using a fire extinguisher, the veranda bench-fire seemed subdued. The corner roof of the pavilion WAS ALSO on fire by then! the roof insulation had caught fire with flames going up the timber paintwork. 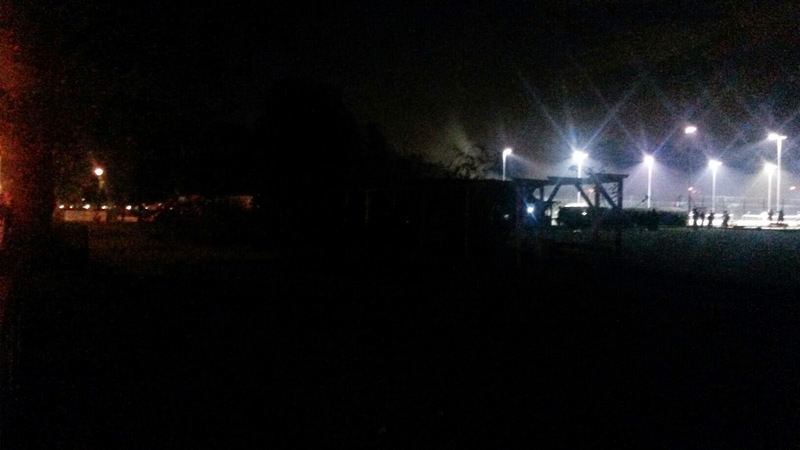 Then when the "boys in blue", the heroes at London Fire Brigade turned up (Krishna has contracted at LFB - HQ in 2006), yours humbly departed the scene leaving the professionals to do their stuff; on his way home taking the first mobile phone picture in the dark as below, where smoke can be seen, if magnified. As to the cause of the fire at the venerable Clapham Common municipality building there is speculation that it was deliberately started by someone taking a personal grudge to the two vagrant amorous couple using the pavilion veranda as their summer 'sleeping rough' abode. 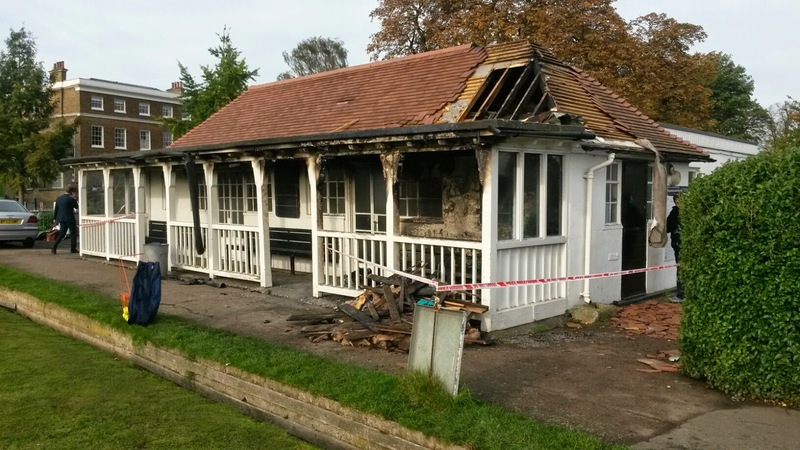 As LineBallTennis Tweeted, with morning-after picture, on the Friday "Some mindless morons have set fire to vagrant bedding at the Bowling Green clubhouse". This Tweet was picked-up by Wandsworth Guardian, the local newspaper. Coincidentally or by design, while I was drawing water in the metal bin from the men's toilet in an attempt to put fire out, the vagrant man mentioned above, whom yours truly the local tennis coach recognises, popped his head in and asked about the commotion. Krishna hurriedly replied "Your stuff is on fire!". To which he exclaimed surprise and repeated the fact, to his partner presumably. While at the scene of the fire I recognised twice a woman who flatly denied any children's pranks for the fire, when I suggested possibility of puerile arsonist. Was it her children whom I had seen near the fire - maybe they spotted it first.